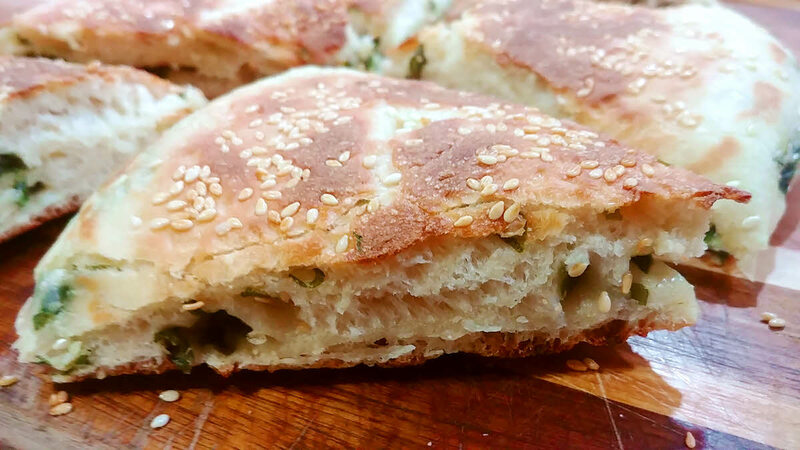 Chinese Bread with Sesame Seeds & Scallions is a great accompaniment to any Chinese food. This is a Muslim Chinese preparation and not available in all Chinese restaurants. Interesting thing is that unlike other breads, it is cooked on the stove. Mix flour, salt, sugar, yeast and 1/2 tsp oil. Knead it with lukewarm water into a soft dough. Knead it for 10 minutes to make a silky smooth dough. Roll it in a little oil and let it rest covered, for about 2 hours. The dough will double in size. Spread the dough in a 10 inch diameter. Spread the cut green onions on the dough and roll the dough into a cylinder. Roll the cylinder lengthwise to make a spiral ball. Flatten the ball again into a 10 inch diameter disc. Sprinkle sesame seeds on both sides evenly and press them to get stuck to the dough. Let it rest for 20 minutes. Heat oil in a pan and gently place the dough in the wok and let it cook on medium-high heat for 5-6 minutes. The dough will puff up. Once the bottom part is brown, gently flip it and brown the other side also. Choose a pan which is about the size of the dough so that the sides touch the wall of the pan and get cooked. Once the bread is brown from both sides, take it out and let it cool down for 10 minutes before cutting. Cutting the bread immediately mashes the bread a little. Cut it in any shape you like and enjoy with hot garlic chilli sauce.